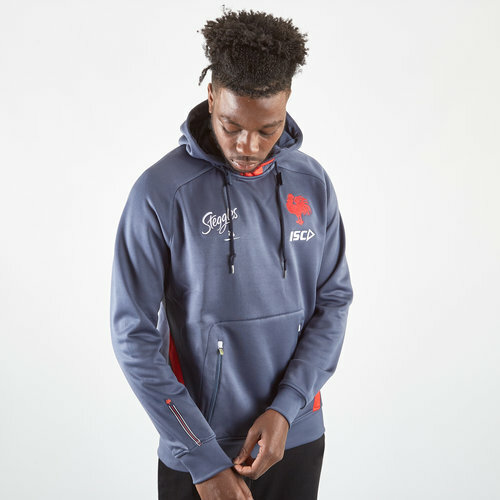 Cheer on the Easts in the 2019 NRL with the Sydney Roosters NRL 2019 Players Hooded Rugby Sweat from ISC. Red, white and blue have been the colours of every jersey design in the club's history; however, the jersey design has undergone several alterations. The jersey worn in the first premiership season consisted of several hoops; red stripes dominated over consecutive smaller white and blue stripes. Although the width and the order of these stripes have changed, the basic design has always been maintained. Sticking to tradition this hoody is navy with red detailing. This sweat comes with a hood and drawstring to create the perfect fit. The kangaroo pocket means you can store away any valuables. The ISC logo and club badge are on the left whilst the sponsor is on the right.